We are the McCourtney's. We are Jesus followers from the south Atlanta area and we ended up following Him all the way to Montenegro. This is a Website for those who are interested in keeping up with the life and ministry of the McCourtney family in Montenegro. We are so excited you are here, feel free to look around. WE ARE PREPARING FOR TEEN STREET BALKANS! The Middle School ministry is comming to a close for the summer. House Church: We love that where two or more are gathered, He is there! And we love inviting others into our home to experience God’s grace together. Youth Meeting between Roma and Montenegrin Youth. Praise God that he is transforming hearts and bringing down barriers and demonstrating the beautiful diversity and unity of His kingdom. more info see HERE. Our first monthly youth meeting included teenagers from Roma Church and the Brethren church. Normally these two distinct ethnic groups do not interact much, but the Gospel makes us all one family. It was a time dedicated to setting our minds on God. We had a time of worship, repentance, meditating on the attributes of God, and praying about our identity in Christ through prayer stations. It was a wonderful time for the kids to be touched by the Holy Spirit of God. 1. Serve the Local Church - missionary seems like such a big word, but really we are just Christians God has called out to live out our faith in another Culture. We belive this is done through community, the body of Christ wherever we live, and our family seeks to serve and love and simply BE the Bride of Christ. 2. YOUTH Ministry - We have a heart for the youth of this nation! Our family is partnering with the youth leader, Violetta Pavotic, with encouraging and discipling young beleivers. 3. Hospitality - We want our home to ba a place of refuge that overflows to those around us. As we seek God's kingdom everyday, we want the Gospel of peace to shine out of our home through love and Hospitality, laughter and coffee! The Last 4 months in America our family felt like Gideon in front of a HUGE army. We have an impossible task with impossible opposition. God proved His faithfulness to our family yet again, providing all the financial support we needed to return, our new baby LOGAN, and great quality time with friends and family! It this summer has taught us anything, it is that our GOD is an AWSOME God, HE provides the victory! We are officially state side until July 22! 1. OM- Operation Mobilization needs all new Missionaries to check in, debrief and work on logistical issues as we plan our future as long term workers. 2. Baby - Fortunately God worked it out perfectly that we are also able to have baby Logan in America! 3. Rest and Spiritual Rejuvenation - Getting Built up by our church famliy and getting caught up on medical care and vaccinations so we can return healthy! 5. TO MEET WITH ALL OUR PARTNERS IN MINSTRY: YOU GUYS!!! We want to connect with as many of you as possible through coffee and small groups. Please give us a call 678-670-1140. Our Youth just returned back from a Conference in Germany called Mission-net! They had a great time and were introduced to more believers than they have seen in their entire lives! PRAISE GOD for providing the opportunity and money and PLEASE PRAY the impact of the conference would bear fruit in their individual lives. Jesse has a whirlwind of preaching opportunities, he preached on the John's Gospel last week and will preach again this Sunday on John 15 about the 'World will hate you because it first hated me". He will also preach in the city of Bar next week, PLEASE PRAY God will give him the words to say! Christmas in Eastern Europe is celebrated on December 7th. Our churches biggest annual outreach is distributing the Operation Christmas Child boxes along with an evangelistic program for the children. Over 1,000 children are able to hear the Gospel and receive a Christmas present they may not have gotten otherwise. PLEASE PRAY for all the workers and hearts of the parents and children who get to hear the gospel. We hosted our Fisrt OM transit team who painted the church and turned a storage room into a much needed kids room! BEFORE - Storage area...AFTER - Kids Room! In August, we held our first discipleship youth camp. Here are some of my girls at Camp - These girls are so hungry for the word and to do deeper! I am humbled by their brave faith. 2. Andrea got to attend the last night of an short term outreach in Niksic, Montenegro, a sports camp called Camp Monty. 20 kids decided to come forward and give their lives to the Lord. PLEASE PRAY thier parents would let them come to the camp we are holding in August so they can learn more and grow in their faith! but sometimes all they want is a ride home. 2. A walk to the market every day. 3. If you stay late enough, parking is free, because the parking attendant goes home and just leaves the doors open. 4. Fresh Bread and fresh produce every day. 5. When you go out running, people stop and ask you if you need a ride somewhere, because, why else would you be in such a hurry? Language is going great, 4 months of lessons, hours of studying and the grammar and sounds are beginning to all come together. We can have short simple conversations with people at church, the market and our neighbors. I had a local tell my I was the first American he knew who could pernouce the 'lj' sound correctly, and i almost died from happiness because Jesse is so much better than be at the language! 40 DAYS OF PRAYER - Here are Videos for weeks 1 & 2 of the 40 Days of Prayer. We would love all of you to join us in this journey together. A project that truly makes a difference. On July 23rd we welcomed Alexander (Xander) Dane McCourtney! He was 9lb 6oz and only took 30 seconds of pushing and all together labor only lasted about 15 hours! Praise the Lord! He is the most precious little guy, loves to eat and is very expressive with his hands! We are so blessed and God has been faithful and provided for our every need! See our Birth Video Below! What's going on in Montengro right now? As their Orthodox friends and neighbours were preparing to celebrate Easter, the OM Montenegro team busily prepared four special evenings, entitled Get Closer. The team spent many months in prayer about this initiative, designed to introduce the basics of the Christian faith and discuss questions. 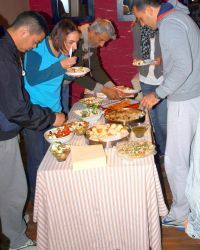 Team members had invited friends and contacts, some of whom had showed interest in the team’s weekly worship gathering. The first night team members laid out finger food that would respect the Orthodox pre-Easter fast and wondered who would come. The team praised God, as on each occasion, an average of six local people came through the doors. The topics explored were God the Father, Jesus, faith and our response and the Holy Spirit. Team member Nicole comments, “We were very positively surprised by the numbers, as well as by who came—some people we didn’t even think were interested! The format opened possibilities for talking about spiritual things with people who usually stick to superficial subjects. They shared honestly and their questions showed that they are seriously thinking about God.